3 March 2017 – Dig Delve – An online magazine about gardens, landscape, growing & making. Yellow breaks with winter. Soft catkins streaming in the hazel. Brightly gold and blinking celandines studding the sunny banks. They are shiny and light reflecting and open with spring sunshine. As strong as any colour we have seen for weeks and welcome for it. There is more to come, and in rapid succession, now that spring is with us. The first primroses in the hollows and dandelions pressed tight in grass that is rapidly flushing. Daffodils in their hosts, pumping up the volume and forsythia, of course, at which point I begin to question the colour, for yellow has to be handled carefully. In all my years of designing it is always yellow that clients most often have difficulty with. ‘I really don’t like it’. ‘I don’t want to see it in the garden’. ‘Only in very small amounts’. Strong language which points to the fact that it prompts a reaction. Colour theory suggests the yellow wavelength is relatively long and essentially stimulating. The stimulus being emotional and one that is optimistic, making it the strongest colour psychologically. Yellow is said to be a colour of confidence, self-esteem and emotional strength. It is a colour that is both friendly and creative, but too much of it, or the wrong shade, can make you queasy, depressed or even turn you mad. Whether I entirely believe in the thinking is a moot point, but I have found it to be true that yellow is a positive force when used judiciously. My first border as a teenager was yellow. I experimented with quantity and quality and by contrasting it with magenta and purple, it’s opposites. 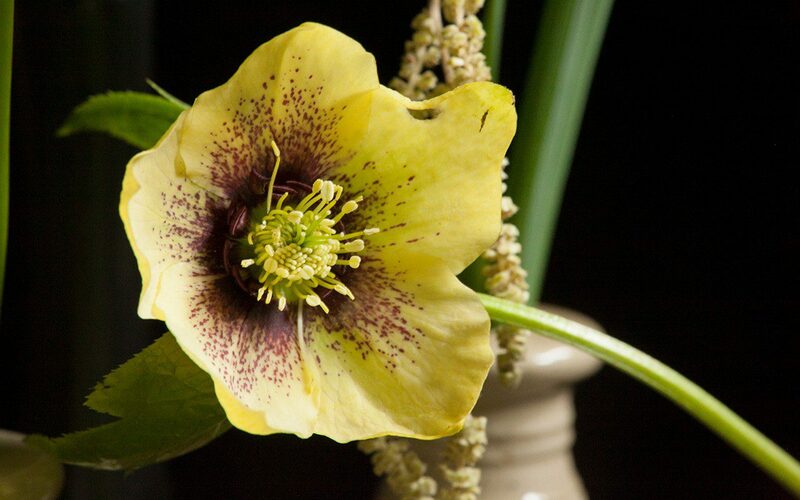 Today I weave it throughout the garden, using it for its ability to break with melancholy; a flash of Welsh poppy amongst ferns or a carefully selected greenish-yellow hellebore lighting a shaded corner. At this time of year, I am happy to see it, but prefer yellow in dashes and dots and smatterings. I will use Cornus mas, the Cornelian cherry, rather than forsythia, and have planted a little grove that will arch over the ditch in time and mingle with a stand of hazel. The fattening buds broke a fortnight ago, just as the hazel was losing its freshness. Ultimately, over time, my widely spaced shrubs will grow to the size of a hawthorn, the cadmium yellow flowers, more stamen than petal, creating a spangled cage of colour, rather than the airless weight of gold you get with forsythia. We have started splitting the primroses along the ditch too. I hope they will colonise the ground beneath the Cornus mas. 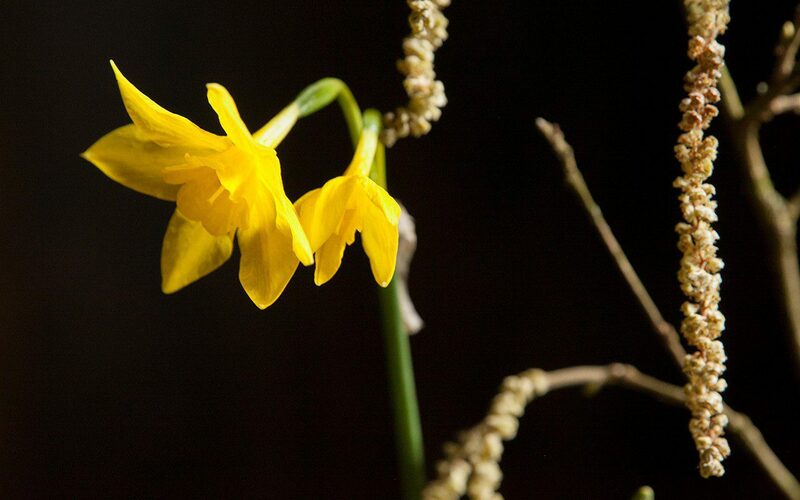 I have a hundred of the Tenby daffodil, our native Narcissus obvallaris, to scatter amongst them. 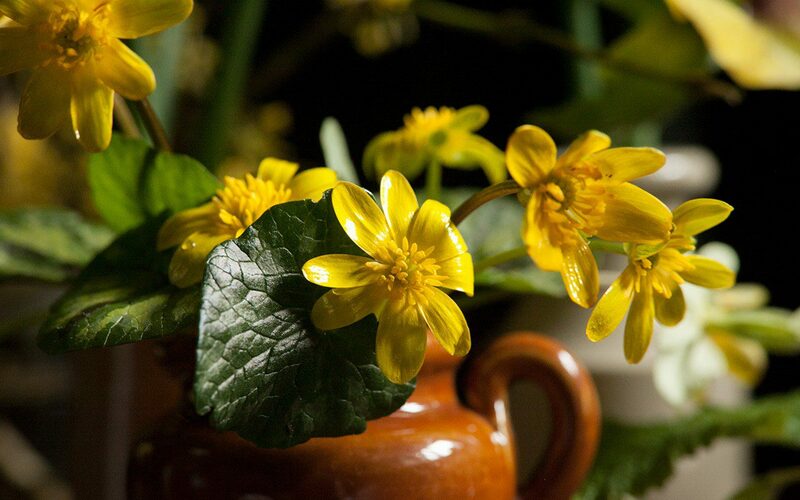 The flowers are gold, but they are small and nicely proportioned. 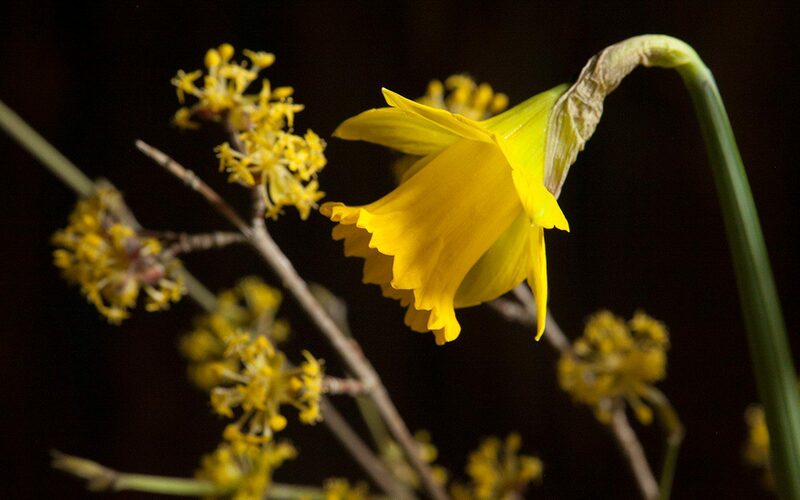 Used in small quantity and widely spaced to avoid an obvious flare, they will bring the yellow of the cornus to earth. 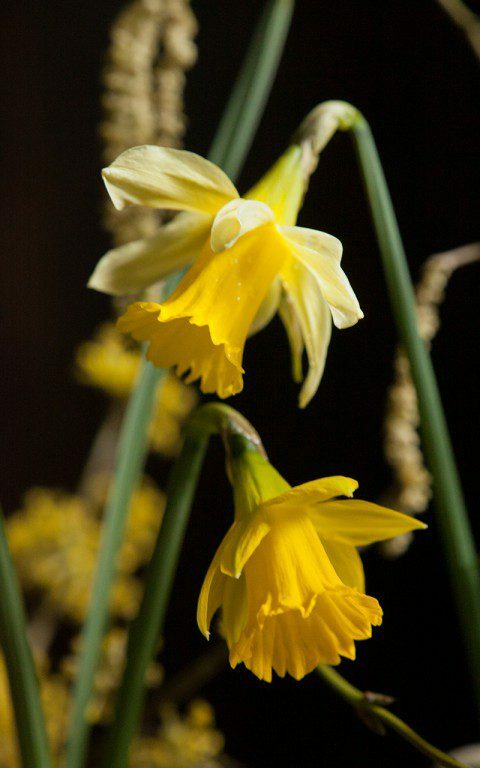 After several years of experimenting with narcissus, I have found that they are always best when used lightly and with the stronger yellows used as highlights amongst those that are paler. 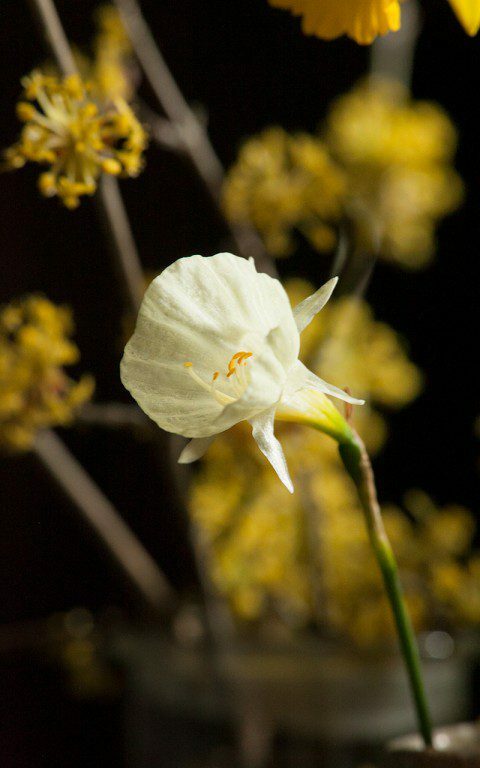 N. bulbocodium ‘Spoirot’, a delightful pale hoop-petticoat daffodil is first to flower here and a firm favourite. I have grown them in pans this year to verify the variety, but will plant them on the steep bank in front of the house where, next spring, they will tremble in the westerly winds. The very first of the Narcissus x odorus and Narcissus pallidiflorus are also out today, braving a week of overcast skies and cold rain. The N. pallidiflorus were a gift from Beth Chatto. 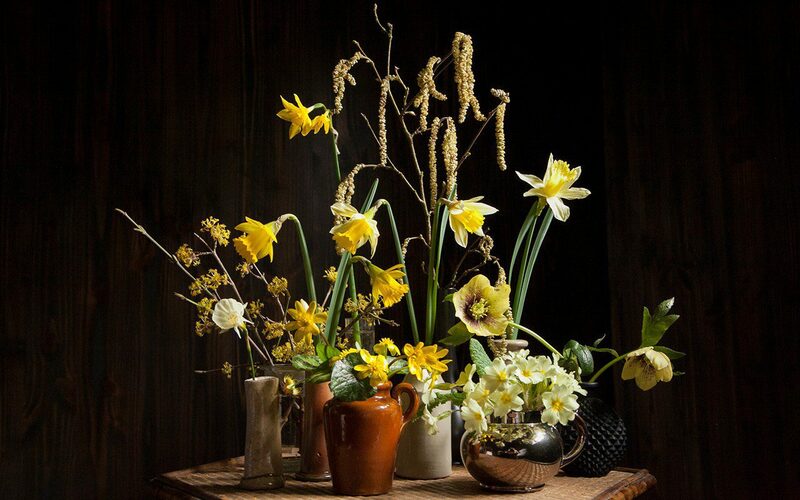 She had been gifted them in turn by Cedric Morris, who had collected the bulbs on one of his expeditions to Europe. 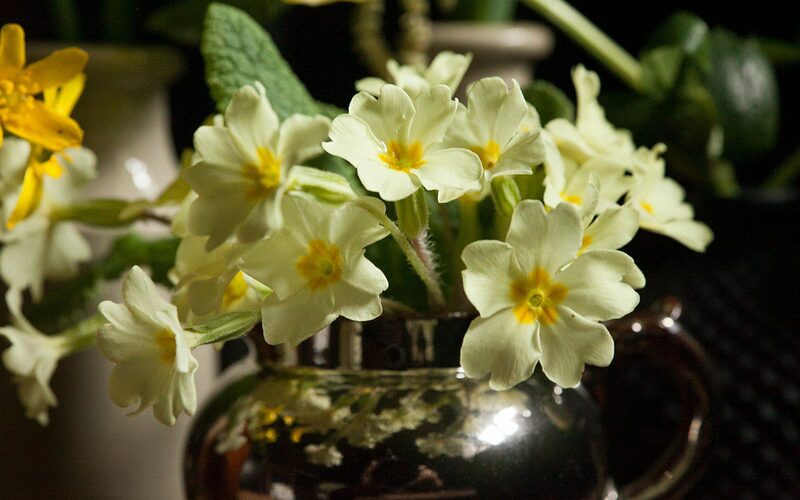 The flowers are a pale, primrose yellow, the trumpet slightly darker, and are distinguished by the fact that they face joyously upwards, unlike their downward-facing cousins. 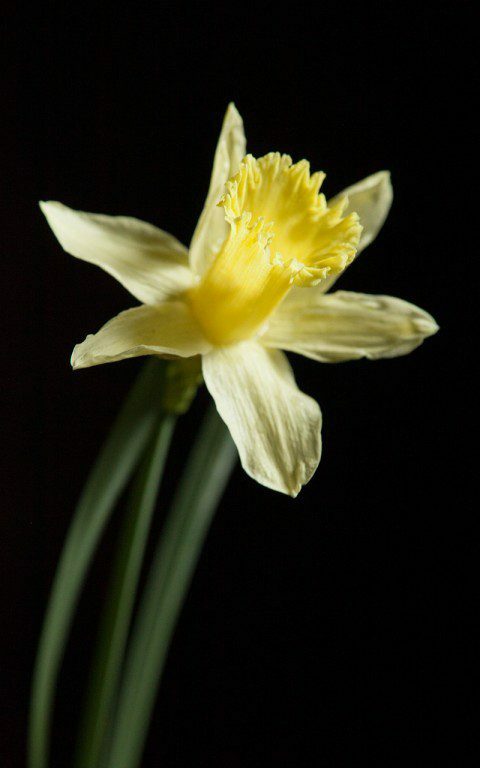 Our other native daffodil Narcissus pseudonarcissus has a trumpet the same gold as N. obvallaris, but with petals the pale lemon hue of N. pallidiflorus. It has an altogether lighter feeling than many of the named hybrids for this gradation of colour. We were thrilled to see a huge wild colony of them in the woods last weekend, spilling from high up on the banks, the mother colony scattering her offspring in little satellites. This is how they look best, in stops and starts and concentrations. I am slowly planting drifts along the stream edge and up through a new hazel coppice that will be useful in the future. A move that feels right for now, with all the energy and awakening of this new season.